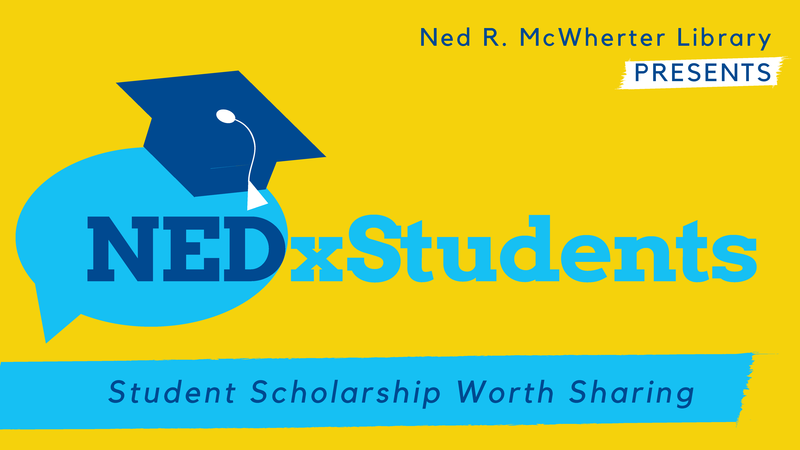 Join us Wednesday, November 7, and Thursday, November 8, 3 pm – 5 pm, at Ned McWherter Library, 2nd Floor Commons, for NEDxStudents, a two-day short-form symposium. UofM students will share their recent research in short presentations designed to engage and entertain. Refreshments will be provided. Lindsay Dolan (City and Regional Planning, School of Urban Affairs and Public Policy) on Mapping Nonconnah Creek, Cardella LaShay Leak (Social and Behavioral Sciences, School of Public Health) on Effectiveness of Health Fairs in Impacting Clergy Cardiovascular Disease Risk Factors Over Time, Lipika Sarangi (School of Communication Sciences and Disorders) on How Do Patient Characteristics Contribute to Hearing Aid Self-Efficacy?, Sara Benson (Counseling, Educational Psychology & Research, College of Education) on My Sister's Keeper: A Qualitative Case Study on How Colorism Affects Private Regard Among African American College Women, Xuan Zhou (Intensive English for Internationals (IEI) Program) on How Have Women Become Inferior to Men?, and Jocelyn Archer (English & Psychology, College of Arts and Sciences) on Pre-School Children’s Ability to Adjust Their Teaching for Different Learners. M. Katherine Reynolds (Psychology, College of Arts and Sciences) on Mental Health Outcomes in Women Exposed to Abusive Romantic Relationships: Does Number of Abusive Partners Matter?, Kamron Jafari (Civil Engineering, Herff College of Engineering) on Partially and Fully Anchored Shear Walls Under Cyclic Loading, Jessica Yoo (School of Communication Sciences and Disorders) on Linguistic, Perceptual, and Cognitive Factors Underlying Musicians’ Benefits in Noise-Degraded Speech Perception, Jalan Veasley (Music Industry, College of Communication and Fine Arts) on Half Glass of Water, and Kasyap Cherukuri (Biomedical Engineering, Herff College of Engineering) on Electrospun Branched-Clusters as Fundamental Units of Articular Cartilage Regeneration.